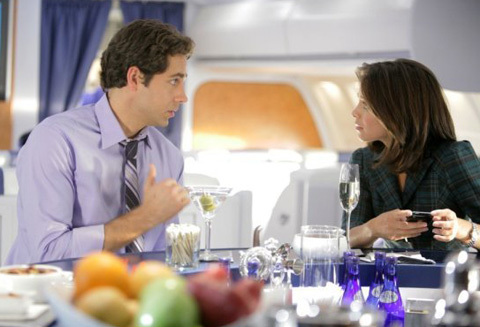 Chuck: "Chuck Versus First Class"
This week's Chuck was No More Mr. Nice Spy's first solo mission that takes place on a plane to Paris where he takes on Stone Cold Steve Austin, a flight attendant/Ring agent, and meets Hannah (Kristin Kreuk). Back in Burbank, Morgan fights off an insurrection with help of Casey, and we get a little more information about Agent Clark Kent (aka Shaw played by Brandon Routh). This week's episode was OK, but nothing special. It was kind of cool seeing Chuck fly solo, but the mission's storytelling was choppy. I'm also a little disappointed about how they introduced Hannah. So, she lives in Paris, was fired from her job, and moves to California to work at a Buy More with Chuck? I have a feeling she's going to end up being a part of the Ring, which has already been done before. Either that or she's a little bit crazy. I did like how we're slowly learning more and more about Shaw, and things are going to get interesting soon. So far, Castle has been on a serious roll, and it won its time slot for the first time (although it was up against a rerun of CSI: Miami), and it deserved the win because this week's episode was one of the best. The case of the week was somewhat interesting, but all of the Caskett stuff is what made it great because we got to see them try to make the other jealous, thanks to Rick being named one of NYC's most eligible bachelors, just to end up together in the end (in a manner of speaking). Good case, great Castle and Beckett moments, and some genuine funny moments from the supporting cast ("I'm telling you bro, puppies...gets them every time.") makes for an almost perfect episode of television. Greek: "I Know What You Did Last Semester"
The kids from CRU are back from winter break, and it's back to the normal craziness. Casey and the ZBZs are hiding the fact that they burned down a rival sororities house, Cappie is hiding his sadness due to losing his closest friends, Evan and Rebecca are hiding their fling, Rusty is being a nagging douche, and Ashleigh is still over-dramatic when it comes to boys. Pretty standard stuff. It's Hell Week at Sacred Heart, or Winston University, or where ever the hell they are nowadays, and Dr. Cox has some tricks up his sleeve in order to torture the med students. He tells Drew to stop helping out his fellow classmates, while making Lucy the new team leader. Of course, Drew can't help but be the leader, and Lucy is much happier being Garfunkel to Drew's Simon. The fact that Drew is Perry Cox, Jr. is pretty much cemented during this episode, while Lucy continues to flounder at pretty much everything she does (although it was fun watching her talk smack). Turk is threatened by a visiting doctor, and acts childish of course, until Denise and Dr. Kelso set him straight. This episode had a few laughs, but overall it was underwhelming. I've said it before, and it's still true, the best part of Scrubs: TNC is the Denise/Turk friendship. Other than that, this season's been pretty forgettable. 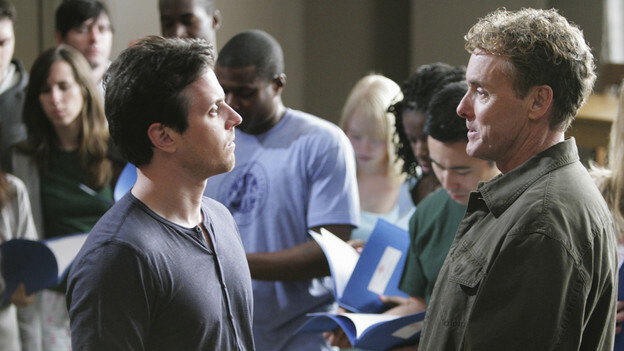 Better Off Ted: "Mess of a Salesman"
To be honest, the highlight of this week's Better Off Ted was Eddie McClintock's (Peter from Warehouse 13 and Sully from Bones) guest spot as Ted's brother. McClintock's Billy brought out a side of Ted, Phil, and Lem that we really haven't seen too much of. For some reason, I'm not a big fan of it when a storyline revolves around just Veronica and Linda because, and the same was true this week. We did get some good lines ("100 and crazy percent"), but that was about it. I know the small following this show has is afraid of the show being cancelled, but it's starting to lose some steam, so maybe it's time to move on. White Collar is slowly starting to win me over. While I liked the first couple of episodes, I was not blown away, so it hasn't solidified itself on my must watch list, but I don't mind catching it on Hulu. Tuesday's episode was a good one mostly because we got to see Neal and Pete essentially con a fellow FBI agent and a federal judge. 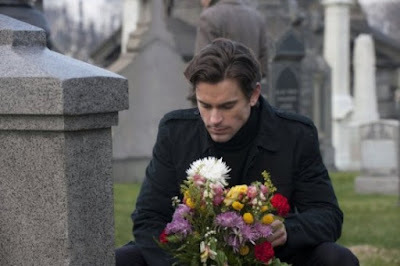 Plus, we're getting more information on Kate, and what that means to Neal. What I'm starting to like about the show is it has the fun, con-ny goodness of Leverage, but with an overarching storyline/mystery. Don't get me wrong, Leverage is still a better show, but it lacks a consistent narrative weaved throughout its canon. Leverage: "The Zanzibar Marketplace Job"
Another week, another great episode of Leverage. This week, we got the return of Sterling (the always great Mark Sheppard), and Maggie (Kari Matchett), and the Crew coming together to save a loved one. We also got to see Eliot run point, which is rare, Parker being Parker, and did I mention Sterling was back? So far, the second part of Season 2 has been better than the first, and Leverage continues to be one of the best shows on TV. Psych: "You Can't Handle This Episode"
I'm going to be upfront and say that I mildly like Psych, but it will never be one of my favorite shows to watch mostly due to the show's main character, Shawn Spencer. He is so juvenile, self-absorbed, and manic that he's annoying bordering on unwatchable. The only reason I tune in is to watch Dule Hill's brilliant portrayal of Gus. This week, John Cena guest starred, and he did a surprisingly good job as Jewel's Army brother with a shady background. While watching this episode I thought to myself, "Cena's character should be on a spin-off" because he's interesting, mysterious, and also likable. I'd watch an Alpha-4 show over Psych in a heartbeat. Bones: "The Dentist in the Ditch"
I don't know if it's because I'm such a big fan of Castle, but Bones has really been struggling this season. Sure, we've had some good episode thanks to some good guest stars (Stephen Fry and Ralph Waite as Booth's grandfather), but majority of the episodes have been second-rate. This week's case about a gay football/dentist was OK, and it was cool seeing Greek's Rebecca Logan (Dilshad Vadsaria) as the girlfriend of Booth's brother, but overall the episode was boring. The only saving grace was Bones' toast at the end of the show.